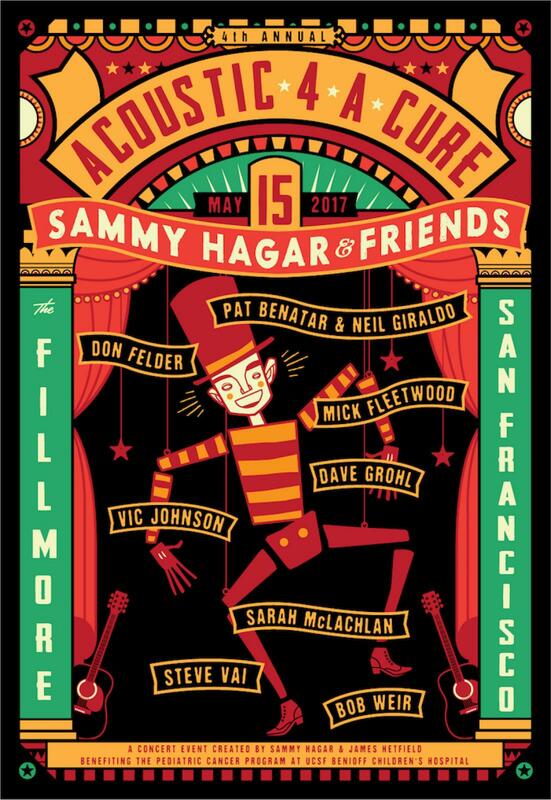 Sammy Hagar and James Hetfield announced the line-up for “Acoustic-4-A-Cure IV,” on May 15 at The Fillmore in San Francisco. Artists performing at Acoustic-4-A-Cure IV include (in alphabetical order): Pat Benatar & Neil Giraldo, Don Felder, Mick Fleetwood, Dave Grohl, Sammy Hagar, Vic Johnson, Sarah McLachlan, Steve Vai and Bob Weir. The 2017 concert blends veterans and newcomers to the event, with Dave Grohl sitting in for James Hetfield, who will be away on tour. Please Note: In an effort to make sure that fans get the best tickets, this concert is a “will call only” event. Doors open at 6:30 PM and the concert begins promptly at 8:00 PM so we encourage guests to arrive early. All ticket orders over the 2-ticket limit will be subject to cancellation without notice. This includes duplicate orders having the same name, billing address, or credit card. Each customer will need to bring their government issued photo ID and credit card used to purchase the tickets to the box office window on day of show to redeem the tickets. Once the ticket order is redeemed the customer must directly enter The Fillmore. All will call tickets must be picked up by the card holder. Alternate names for Will Call will not be permitted. You cannot leave tickets at will call to be picked up by someone else. No “drop-offs.” Live Nation will cancel any and all orders without notice that exceed the ticket limit.